through the general recruitment of UPSSSC Competitive Examination. There are total 694 vacancies available in this UPSSSC recruitment 2018 notification. Out of 694 posts 42 vacancies for Yuva Kalyan Adhikari and 652 Posts for Vyayam Prashikshak and Vikas Dal Adhikari jobs. Eligible candidates can apply online on or before 23/04/2018 through official website of UPSSSC @www.upsssc.gov.in. This Yuva Kalyan Adhikari, Physical Trainers recruitment of UPSSSC will be held through written exam and physical tests conducted in two stages. 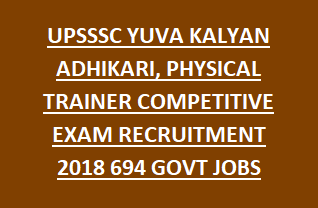 See the below given info for number of vacancies, exam pattern and syllabus, physical tests, important dates, age criteria, physical events details, qualification, and how to apply online for UPSSSC Yuva Kalyan Adhikari, Physical Trainer (Vyayam Prashikshak) jobs recruitment 2018..
Click here to see the official notice of UTTAR PRADESH SSSC Yuva Kalyan Adhikari , Physical Trainer (Vyayam Prashikshak) Recruitment. For both the posts degree qualification is required. B.Ped or D.Ped qualification is desirable. Candidates must be fit physically. The candidate's age limits as on 01-July-2018 is 21-40 Years. For Ex Service man 3 years, For SC/ST 5 years and for OBC candidates 3 years of upper age relaxation is given. Selection for this UPSSSC Yuva Kalyan Adhikari, Physical Trainer recruitment 2018 will be held based on common objective type multiple choice written test, Physical Standards tests and physical efficiency test. Syllabus and exam pattern for this Vikas Dal Adhikair, Youth Welfare Officer posts are Group C mode only which is issued by UPSSSC in 2015. For General and OBC exam fee is Rs.185/- and for SC/ST Rs.95 and for PH candidates examination fee is Rs.25/-. Online applications only accepted for this UPSSSC recruitment of Yuva Kalyan Adhikari, Vikas Dal Adhikari and Vyayam Prashikshak. More information related to his UPSSSC recruitment is given in notification. Last date to apply online is 23-04-2018. Submit application form through www.upsssc.gov.in website. Click here to apply online for the UTTAR PRADESH SSSC Yuva Kalyan Adhikari, Physical Trainer Recruitment 2018.